A Digipeater is a station that does digital repeating. Unlike full-duplex VHF/UHF voice repeaters, a digipeater will receive a packet, process it, and retransmit on the same frequency. A digipeater which operates on multiple frequencies or routes between RF and Internet traffic is called a gateway. The idea is to get packets to propagate outward from the initiating station… but not so far as to be an unnecessary burden on the system and surrounding users. 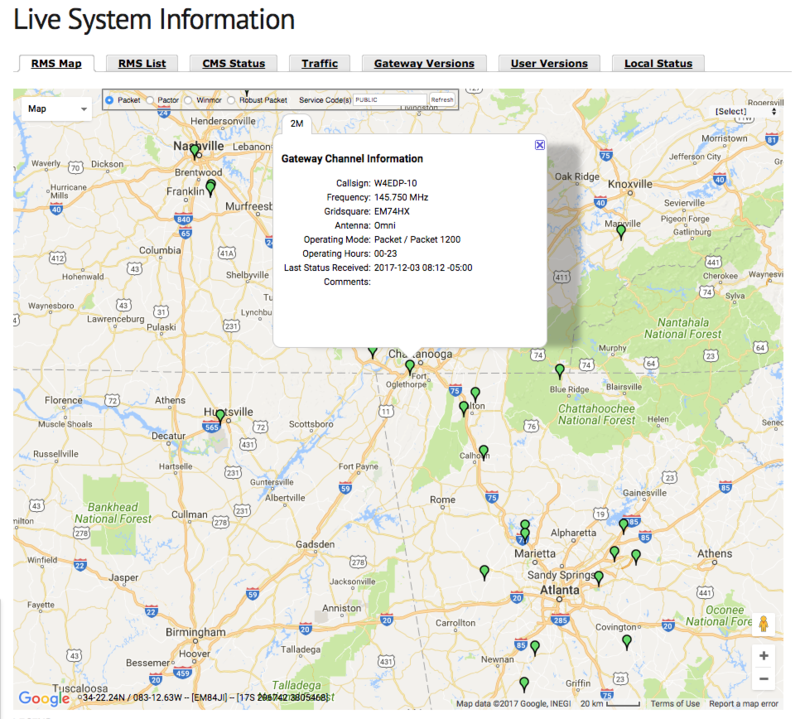 The RMS Gateway Digipeater that W4EDP owns and operates covers the Chattanooga, TN and Lookout Mountain areas, as well as most all of NW GA. It operates on a frequency of 145.750 and is designated W4EDP-10. Winlink, also known as the Winlink 2000 Network, is a worldwide radio messaging system that uses amateur-band radio frequencies to provide radio interconnection services that include email with attachments, position reporting, weather bulletins, emergency relief communications, and message relay. The system is built and administered by volunteers and administered by the Amateur Radio Safety Foundation Inc. The APRS Digipeater that N4LMC owns and operates covers the Chattanooga, TN and Lookout Mountain areas, as well as most all of NW GA. It operates on a frequency of 144.390 and is designated N4LMC-3. 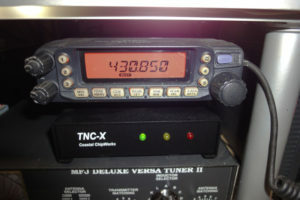 This system operates as a Tx/Rx iGate & Digipeater. APRS data is typically transmitted on a single shared frequency to be repeated locally by area relay stations (digipeaters) for widespread local consumption. In addition, all such data is typically ingested into the APRS Internet System (APRS-IS) via an Internet-connected receiver (IGate) and distributed globally for ubiquitous and immediate access (see more below on this). Data shared via radio or Internet is collected by all users and can be combined with external map data to build a shared live view. Take a look at https://aprs.fi and see what’s happening around you! APRS has been developed since the late 1980s by Bob Bruninga, WB4APR, currently a senior research engineer at the United States Naval Academy. He still maintains the main APRS Web site. The initialism “APRS” was derived from his call sign. An IGate is a type of gateway APRS station. It is similar to a network router in the TCP/IP world, or to a “voting receiver” in a wide-area radio repeater network. The IGate’s job is to selectively allow packets to cross between the APRS-IS and the local RF network. Gating to the RF side is a little trickier. The technical parts are not difficult but the limitations of the RF channel and regulatory restrictions attendant with radio transmissions make things more difficult. Many IGate implementations will only send to RF those packets destined for stations that have been recently heard on the RF side or that are in a list of designated destination stations. Winlink RMS Gateway – 145.750, W4EDP-10. Greater Chattanooga, Lookout Mountain, TN, NW GA and NE AL areas. APRS I-Gate – 144.390, N4LMC-3. Greater Chattanooga, Lookout Mountain, TN, NW GA and NE AL areas.